On-shore volunteers from the marine conservation group Sea Shepherd made a horrific discovery of a mass grave of dolphins in the French coastal town of Les Sables d'Olonne. The dolphins are just a few of the thousands that are killed as bycatch by local fishing vessels every winter, hundreds which wash up on the beaches of the Bay of Biscay showing lethal injuries from fishing gear. Municipal authorities in Les Sables d'Olonne collect the dead bodies each day from the beach and dump them in a pile hidden from public view until they can be sent at the end of each week to a rendering plant. The image here, taken by Sea Shepherd, represents just one week’s worth of dead dolphins. According to scientists, only 20% of the dolphins killed eventually wash up on the beach, which means it’s possible that several thousand have already been killed this year since 700 bodies have been found since the end of December. Sea Shepherd’s vessel the M/Y Sam Simon has been patrolling the French Atlantic Coast since February 11th to monitor the fisheries responsible for catching dolphins in a campaign called Operation ByCatch. Footage of dolphins in the nets of French trawlers has already been captured by the crew. Trawlers use a pelagic trawling method that deploys a huge funnel-shaped net in the water between two vessels, known to be non-selective and particularly destructive on the spawning grounds of the sea bass where dolphins swim. "During our patrols, we encounter many dolphins every day in this particularly sensitive area,"
said Lamya Essemlali, President of Sea Shepherd France and director of the campaign. For scientists, the first step towards improving the situation would be to clearly identify the responsible vessels by means of observers or on-board cameras. While in many countries this presence is mandatory, France not only allows destructive fishing methods in sensitive areas, but also gives its fishermen the choice to refuse any independent observation. The trawlers from Les Sables d'Olonne and Saint Gilles that Sea Shepherd filmed with dolphins in their nets have refused any observers. “When will the law require this? How long is the government going to let a handful of people block any progress on this issue? How can we explain the fact that fisheries committees have such power and impunity in this country?” asks Essemlali. 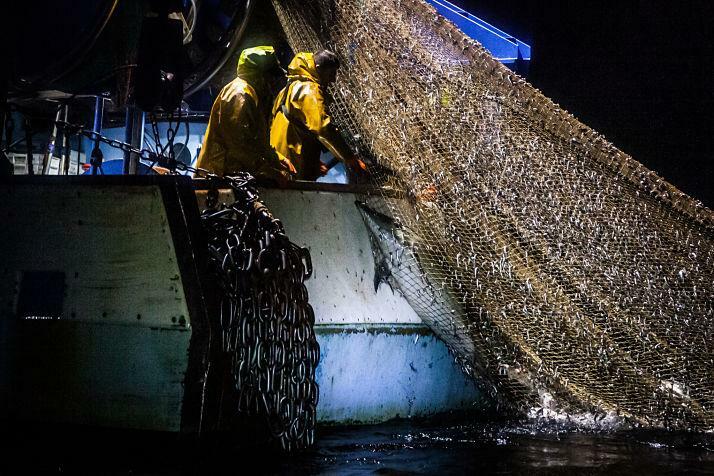 "It has to be said that apart from the declarations of intent issued by press releases every year, the government does not take the problem seriously and is mainly concerned about protecting the needs of fishermen." France is a signatory to the cetacean protection conventions and is committed to implementing concrete measures to minimize their catches. Scientists are concerned because dolphins are a sensitive species which are slow to reproduce their few offspring. By the time the decline in their population is visible, it is usually too late. "Thirty years of meetings and discussions with the fisheries committees have led to the catastrophic situation we are in today," continues Essemlali, who denounces the most significant stranding ever recorded. "The time for discussion is over, there is an urgent need for action." The President of the Loire Fisheries Committee, José Jouneau, claims - and is routinely quoted without official verification - that this year all trawlers are equipped with pingers (acoustic repellents). However Sea Shepherd was informed by a reliable source that this is not the case, which we were able to verify in the field. The two trawler nets surveilled in February that contained dead dolphins had no pingers. And if there had been pingers, they would have proven their ineffectiveness. The case of the dead dolphins is only the tip of the iceberg. Sea Shepherd has also documented trawlers fishing in the middle of the Rochebonne plateau on several occasions during our patrols, although this year trawlers are forbidden to trawl to allow the environment a recovery period. What controls and sanctions should be applied to these poachers? We filed a complaint against two of them we caught in the act of illegal fishing, one registered in Saint Nazaire and unloading at La Turballe, and the other registered in Les Sables d'Olonne. The two ships were poaching in the middle of the Rochebonne plateau without even bothering to shut off their AIS (automatic identification system), demonstrating an attitude of total impunity that reigns in the area.